amplexus (title of Chapter 28) - I always pick up the oddest bits of trivia reading Diana's books, and this is one of my favorite examples from SCOTTISH PRISONER. baulk (p. 356) - When I asked Diana if she meant "bulk", she said, "No, I really did mean 'baulk'. It's a somewhat obscure word, meaning a nondescript chunk of something. Almost the only place you see it in modern English is references to 'baulk(s) of timber,' meaning some random piece of ungraded wood, length and shape unspecified." defalcations (p. 16) - compare this to peculation, which is also used in the book (p. 176) but which I don't count as a new word because I first saw it in "The Custom of the Army", in reference to Major Siverly's activities. embranglement (pp. 171-72) - also spelled imbranglement. Diana explains this word in the Author's Notes at the end of the book: "period colloquialism; an onomatopoetic word that means just what it sounds like: complicated and involuntary entanglement, whether physical, legal, or emotional." fridstool (p. 174, also title of chapter 14) - see Diana's explanation on Compuserve here. hockogrockle (p. 190) - the sound of this word makes me smile. stocious (p. 106) - I love Nessie's way with words. What about the rest of you? Do you have a favorite new word or two that you picked up from THE SCOTTISH PRISONER? Kerfuffle! This word isn't new to me but I haven't heard it for a long time. My Dad used it when we were kids. He also calls me "wean"! I like "kerfuffle". The sound of it makes me laugh. An absolutely magnificent story written by one of the world's most truly talented authors. Whilst written as a stand alone book, it does help to have read Cross-stitch and Voyager to set the context. 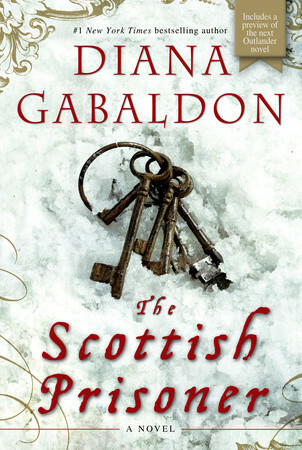 Centred on James Fraser and John Grey the story conveys the depths of loneliness Jamie lived through when separated from Claire and the bond that forges the long term friendship bewteen John and Jamie.